Anyone would tell you that black bear attacks are rare. While that may be true, there are still predatory black bears, who have learned to prey on humans. 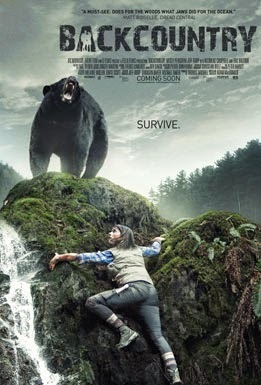 Backcountry is based on a true story of a bear attack in Algonquin Park, Ontario Canada. MacDonald himself describes it as essentially Open Water, set in the woods. The film took 3 years to make, and was shot with real bears, which, along with the on-location shooting, gives this film an authenticity it would otherwise lack. MacDonald's story began with an idea he had while camping with his wife. Upon investigating similar stories, he happened upon several of them, but the one that serves as the primary influence is a particularly tragic one (I'll link to an interview with MacDonald at the end). 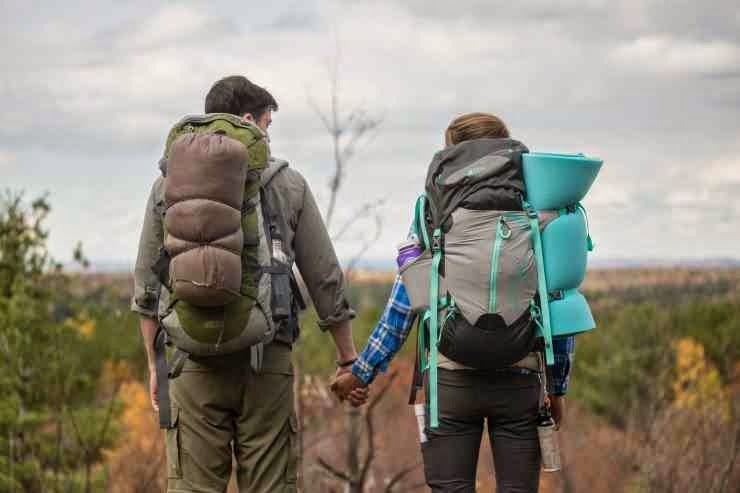 Jenn (Missy Peregrym) and her boyfriend Alex (Jeff Roop) hike and camp their way to a remote lake in Algonquin Park. While setting up camp, they have an awkward encounter with Brad (Eric Balfour), a man claiming to be a backcountry tour guide, who seems to have an inappropriate interest in Jenn, and an unusual sense of competition with Alex. It's an eerie scene that serves to make us question who or what could be following them later in the film. Speaking of which, throughout the film there are shots from off in the distant woods that make our point of view that of something following them, or spying on them. Along the way they make a series of fatal mistakes. The first being, the refusal of a map. Alex is positive he knows the way, and wants to experience the outdoors, as if to test his survival instincts. Mistake two, he also secretly takes Jenn's cell phone out of her bag, and leaves it in the car, even if it's unlikely they'd find reception, it would have been better to have it just in case. The biggest mistake however is simply making a few wrong turns along the way. It shows the possible consequences of not respecting nature by a little bit of negligence and over-confidence in your own abilities. MacDonald allows the couple's intimate details to surface slowly, naturally, without expository flashbacks or dialogue heavy narration. 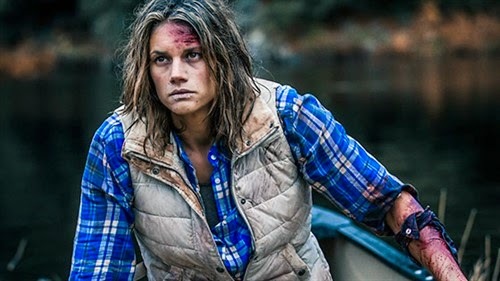 The performances given by both Missy Peregrym, and Jeff Roop are both excellent. They have great chemistry, which lends a credibility to their relationship. Their fear, and terrifying situation brings out the worst, and perhaps the best in them as they're forced to rely on (and even blame) each other. Once they realize they're lost, they have no choice but to cooperate. Spoilers or not, we know where the film is heading, and it's as unsettling and it probably should be. The fact that MacDonald was able to make us care about the couple, and portray the events in gruesome detail, allows the film to get your adrenaline going. It's with respect and care for the stories that inspired the film, that MacDonald captures the terror of the situation, the fragility of human life, and the will to survive. The soundtrack is appropriately atmospheric and minimalist, even disappearing in the most nail biting moments. Overall, the film is certainly effective in making a less than average nature enthusiast think twice about a camping trip. This is a strong debut film for MacDonald, who we'll have to keep an eye out for in the future. It's being called a horror film, and perhaps that's the right genre label, but unlike most horror films, this has an authenticity to it that allows for genuine fear. Here's the story of the bear attack that inspired the film.